This organization is founded to search for the possibilities of social and regional integration of Asia based on the theories and practices in the fields of humanity and social science such as political science, economics, law, sociology, history, area studies, and gender studies. We also seek the way to enhance the relationship between Asia and other regions: North and South America, Europe, Pacific rim, Africa, and Middle East, for example. 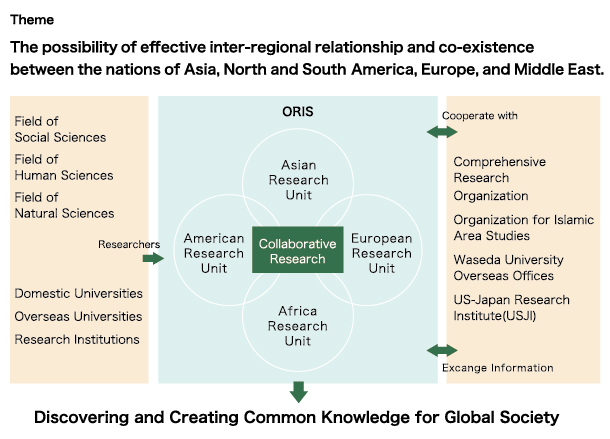 With these projects, this organization creates the locus for the transdisciplinary regional and inter-regional studies in from the viewpoint of Asia Waseda University. This organization tries to discover and / or create the common knowledge that is to be shared among the regions such as Asia, North and South America, Europe, Pacific rim, Africa, and Middle East while fully appreciating the diversity and uniqueness among them. This organization offers a place of communication, based on academic networking, for the entire Waseda University including the business sections in order to promote inter-regional studies to discover and create the global common knowledge. We also promote the academic-business exchanges and research with universities in Japan, with universities overseas and with other organizations and think tanks. Through the academic-business exchanges, we aim to support young research fellows via the exchange. This organization actively publishes the theories and findings of the inter-regional studies from Waseda, and tries to gain international recognition of them.